Welcome to our second Sponsor Spotlight for fall! Here's another lovely lady you should all get to know! When I first saw Crystal's blog Billie Jean, I thought...bees, vintage, and shes a momma just like me...what could be better!? I love her blog, and reading about her little! She also has an etsy shop full of fun jewelry. There are a few pieces that I'm just dying for! My name is Crystal & I am 25 years old. I am also a mother, wife & entrepreneur. I blog over at Billie Jean on typepad & you can also find me over at Etsy under the shop name, Billie Jean Jewels. I am a jewelry designer, along with being a full time blogger (& mother). My style is very eclectic, I love anything vintage and/or bohemian. My daughter, who is also the love of my life, is my number one priority & I just take it day by day. I have been through quite a lot in the past couple of years: getting married, having a child, graduating from college, moving out of state & buying my first home! 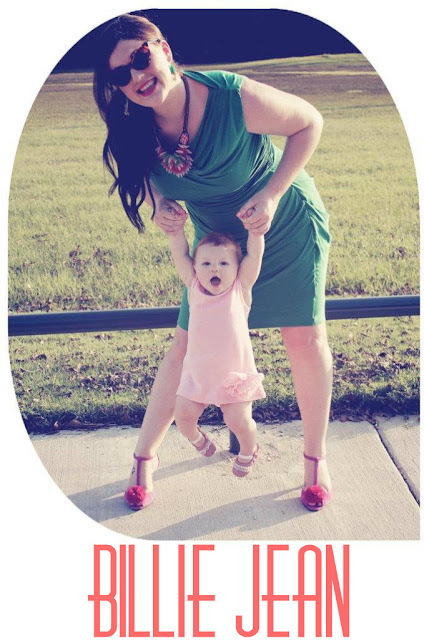 My blog captures my everyday life & how I juggle being both a mom & a career woman! I started blogging because I take so many pictures of my daughter. I know my Facebook friends get annoyed when I post 100 pictures at a time of Tory, so I needed another outlet for posting mass quantities of pictures of my life. I also have been through a lot of life changing milestones in just a year & a half, so with that, I have a lot to share & say. With my blog, I hope to relate & start new friendships with other bloggers, mothers, small business owners & other people who are a lot like me! Sometimes, just knowing that there are others out there who can relate to your biggest transitions in life is very helpful & comforting. In the simplest terms, my blog is about fashion & family (my two loves). Along with sharing my life with the world, I also have a brand, Billie Jean, that I have created with this blog & Etsy shop, Billie Jean Jewels. My blog header is my logo & I hope to build my brand bigger & bigger everyday. I want my jewelry business to grow, along with my readership & then one day, expand into cosmetics & the beauty industry. Entrepreneurialism is in my blood, runs in the family. I don't think small, I think big. I want to be able to provide for my family & help pave the way for other mothers who also want to make their way into the business world. Hope you all enjoy her and her blog as much as I do! Oh me too! I love her etsy shop! Oh wow, her blog is beautiful! And love her jewellery and fashion sense! I know! She's quite the lady! Thanks for getting me hooked on another awesome blog! Hello chica de ojos increibles!!! I love discovering new blogs, I'm running to see her!!! !